We have close links with our missionaries. Killaloe Diocese has an impressive record of supporting the missions. Many people in parishes throughout the diocese personally know missionaries, priests, religious and nowadays too many lay missionaries. The annual Mission Sunday collection usually on the second last Sunday of October provides a focus for supporting all missionaries throughout the world. The money raised on mission Sunday goes to the missions on the basis of the greater need. The generosity of people to this collection is outstanding but the need is also outstanding. This need is greater as faith communities throughout the world have been plunged into a recession far greater than anything you or I can imagine here at home. 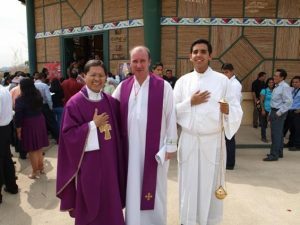 Our diocese continues to have many natives of the diocese as priests, religious and lay volunteers working specifically in nurturing faith in young churches throughout the world. These continue to keep the mission story alive in our consciousness by the wonderful work they do in promoting active and living faith communities often among the poorest of the poor. From the early 1980’s KIllaloe diocesan priests have volunteered to work in Zimbabwe together with the Carmelite Fathers and more recently in Equador with The Society of St James and in Peru with the Columban Fathers. World Missions Ireland is the umbrella title for the Societies for the Propagation of the Faith, St. Peter Apostle, Missionary Children, and the Union of Priests and Religious. The society of Peter the Apostle supports the formation of priest, Children Helping Children which supports projects involving children and missionary awareness among children in primary schools here at home. Mission Alive by Irish Missionary Union does similar work for Secondary Schools.